It seems like it was only just yesterday that a bunch of musically hungry teenagers from Liverpool (technically Hoylake) dropped their much hyped debut album in the summer of 2002. That self titled album was chock-full of sea shanty madness, neo-psychedelia and shades of early Captain Beefheart and his Magic Band. Since then the band have explored a kaleidoscope of sounds ranging from psychedelic folk, jangle guitar pop, cinematic soundscapes and dirty stoner rock. 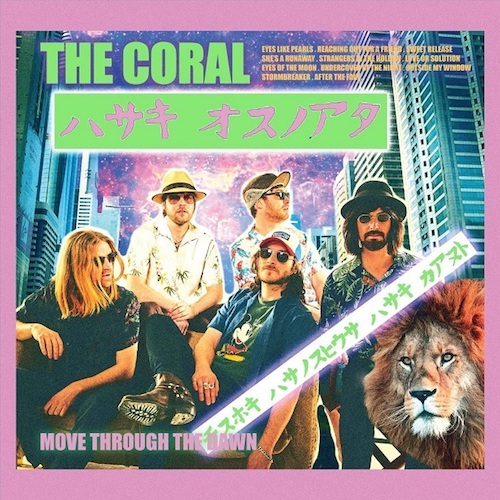 That is probably why their ninth album, Move Through The Dawn, feels like a greatest hits compilation of all the sonic textures that made The Coral so fascinating to listen to over the last 16 years. The album opens with two tracks that have a heavy dose of Electric Light Orchestra sprinkled on top of them, “Eyes Like Pearls” and “Reaching Out For A Friend”. It seems The Coral have finally left the 60s and gone straight to mid 70s prog rock. Lead single “Sweet Release” is the catchiest song on the album and could have easily found a home on their previous album Distance Inbetween with its dirty guitar grooves. One might even say it is the “dance” track on the album. The quieter nature found on the album Butterfly House looms large on tracks “She’s A Runaway” and “After The Fair”. Elsewhere “Eyes of The Moon” harks back to the gentle folk stompers found on Magic And Medicine and “Outside My Window” channels the darker spirit of The Invisible Invasion. Penultimate track “Stormbreaker” sounds like the unofficial theme song for Daenerys Targaryen (Game of Thrones) as she brings her wrath to the shores of Westeros. Two of the best offerings from Move Through The Dawn can be found on the Todd Rundgren meets Big Star rocker “Love or Solution” and the bittersweet yet lush “Undercover of the Night”. Both tracks sound like they could be transported from another era in time, straight from a AM rock radio station. The Coral can capture your ear by many different paths. They can freak out like on their self titled debut, they can put a joyous bounce into your step or soundtrack the perfect sunny afternoon in the countryside. This new album has the feel of coastal driving in the summer with the top down, volume up and endless road to discover. Just keep in mind, this record is only 35 minutes long so consider looping it for your journey. Previous Madison Square Garden and the Infinite setlist….